A Few of this F-150's key features include: WiFi Hotspot Capable, Remote Engine Start, an Onboard Hands-Free Communications System, Steering Wheel Audio Controls, All Wheel Drive, Four Wheel Drive, Keyless Entry, Aluminum Wheels, Power Windows, a Back-Up Camera, Fog Lights, Electronic Stability Control, an Anti Theft System, Front Tow Hooks, Traction Control, a Electronic Messaging Assistance, Steering Wheel Controls, an Auxiliary Audio Input, Driver Restriction Features, Power Locks, Power Mirrors, Daytime Running Lights, a Spare Tire (Full Size), Cloth Seats, Brake Assist, Tinted Glass, a Pass-Through Rear Seat, an Auto Transmission with Manual Mode, Flexible Fuel Capability, Anti-Lock Brakes, a Rear Head Air Bag, a Bench Seat (Split), an Adjustable Steering Wheel, Disc Brakes, Privacy Glass, Bluetooth Connection, an AM/FM Stereo, an MP3 Compatible Radio, a Tire Pressure Monitoring System, Cruise Control, Air Conditioning, a Drivers Air Bag, a Passenger Air Bag Sensor, Child Proof Locks, Intermittent Wipers, a Front Head Air Bag, an Auto Headlamp, a Front Side Air Bags, a Passenger Air Bag, Vanity Mirrors, a Tilt Steering Wheel, a Bench Seat, Power Steering, and Variable Speed Intermittent Wipers. Come check out this 2019 Ford F-150 XLT, Stock# KFB62127 which features a Oxford White exterior with a Medium Earth Gray Cloth interior. Factory equipped with an impressive 2.7l v6 ecoboost engine, and a automatic transmission with four wheel drive. 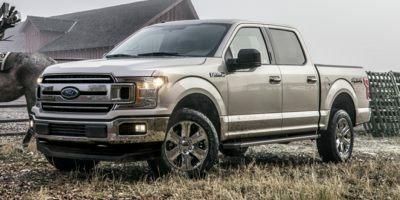 This 2019 Ford F-150 XLT also comes equipped with: Variable Speed Intermittent Wipers, Power Steering, a Bench Seat, Vanity Mirrors, a Passenger Air Bag, and a Tilt Steering Wheel along with Intermittent Wipers, Child Proof Locks, a Passenger Air Bag Sensor, a Front Head Air Bag, a Front Side Air Bags, and an Auto Headlamp. Contact Eby Ford today at (574) 534-3673 to schedule your test drive of this 2019 Ford F-150 XLT! Or stop in and visit us at, 2714 Elkhart Road Goshen IN, 46526 to check it out in person!